If there’s any supervillain team-up in comics right now that people should be reading right now, its this book. Despite the lack of plot progression in the middle issues, the humour has always been there, and the book is really fun. The Rogues are a great team, defined by their individual differences, and the strength of their relationship to each other, especially when things are really personal such as the romance between Mirror Master and Glider. And ultimately, that’s what this particular issue comes down to: how far can they go to save one of their own. Its not a surprise that I’m a fan of Brian’s writing. He won me over with his work on The Flash and he’s done the same here on this series. What Brian does in this particular issue is to develop the Royal Flush gang further, showing how they are more than a gang of four, and he also goes back to the series roots by bringing back Johnny Quick and Atomica to deal with the Rogues. This is something that I’ve been wanting to see more of since we first saw it in the mini-series. It highlights the “Rebellion” part of the series name. In keeping with Johnny Quick and Atomica’s other appearances in the various Forever Evil titles and tie-ins, they are very graphic with their violence. To them its all fun and games. It is an extreme form of the kind of morbid humour that the Rogues often employ, and the contrast is nice to see. But thing is, I just love seeing these two villains on the pages. I find them fascinating, especially after we got to see their origins on Earth 3 in a previous issue of Justice League, written by Geoff Johns. And that is something that Brian references here, with Johnny’s dialogue to Mirror Master. Because the thing is, nobody knows that the Crime Syndicate is from an alternate Earth. And that’s the big surprise here. But the biggest surprise here, or I guess not a surprise but a reaffirmation, is the Rogues coming together. With Captain Cold and Heatwave missing, and Glider in a coma, its only Trickster, Mirror Master and Weather Wizard around. Half the team left to take on the entire Royal Flush Gang and two members of the Crime Syndicate, the latter of whom have pretty much taken out everyone who has stood up to them (more on that in Justice League and Forever Evil issues). All of this means that the action in this issue is pretty top-notch, the kind that really gets your heart pumping. Scott Hepburn comes back for the pencils, with Nick Filardi on the colours and Carlos M. Mangual doing the letters with Dezi Sienty. The art is top-notch here. There are times when the characters don’t seem quite so consistent, but by and large the art was pretty damn good. I love the colours here, I love the pencils in general, and I love how many details that Hepburn packs into each panel. Damn good art. And the cover by Declan Shalvey and Jordie Bellaire is yet another excellent cover for the series. These two have done an incredible job so far and I can’t wait to see what they do for next month’s issue, which will wrap up the series. Overall, a great issue that picks up from some of the deficiencies of the previous issues and sets the stage for something really fun. More Forever Evil: #1, #2, #3, #4, #5; (Arkham War) #1, #2; (Rogues Rebellion) #1, #2, #3, #4. 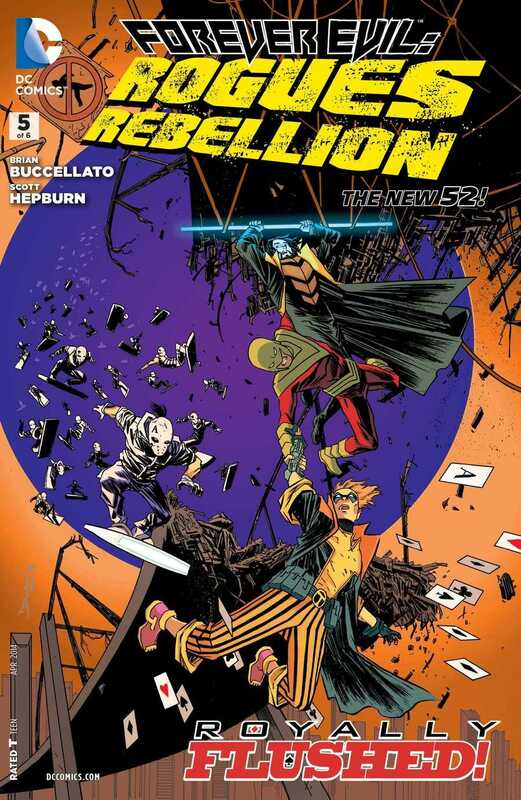 Posted on February 15, 2014, in Comics Reviews, Review Central and tagged Atomica, Brian Buccellato, Captain Cold, Carlos M. Mangual, Comics, Crime Syndicate, Declan Shalvey, Dezi Sienty, Forever Evil, Forever Evil: Rogues Rebellion, Gotham, Johnny Quick, Jordie Bellaire, New 52, Nick Filardi, Review, Review Central, Rogues, Rogues Rebellion, Royal Flush Gang, Scott Hepburn, Supervillains, The Flash, Trickster, Weather Wizard. Bookmark the permalink. 2 Comments.